Have you ever been forced to make a very difficult decision? Are you going to change your job and are you afraid to jump into the void? Or are you looking for the right time to declare yourself to the person you like? The first rule, in these cases, is to never make hasty decisions, but to reflect on it, analyzing what are the pros and cons. Pros-Cons is a simple and functional app that helps you make the right decision for every dilemma you have: it does not make decisions for you, but it always helps you make the best decision. 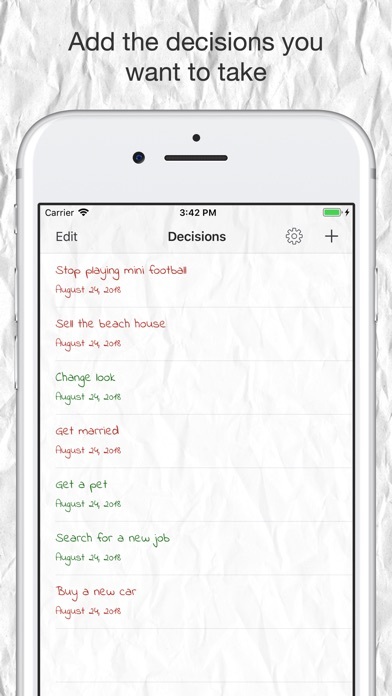 Within the app you can add the decisions you'd like to make. Then, for each decision, you can add a list of advantages and a list of disadvantages. Every point, advantage or disadvantage that it is, will have a weight (which varies from 1 to 5), which will help the app to give you the most appropriate suggestion. Once you have added all the advantages and disadvantages, the application will analyze the points you have entered to suggest whether or not to take the decision. The application also has its social side: each decision can be shared via any instant messaging platform or can be saved as a PDF to be printed. Take your first right decision and download Pros-Cons now! Tottie - Fatti un selfie con Francesco Totti!